This originally appeared on Brain, Child. Republished here with permission. I knew before I met my husband, before I even cared about the world of dating, that making and maintaining friendships with other couples would play a central role in my marriage. As a child, I’d stay in the room while my mom spoke to her friends on the phone. She’d balance the receiver between her ear and her shoulder so she could thumb through the pages of her velvet green appointment book. While looking for open Saturday nights, she’d tap her pencil on the desk, and I’d catch her side of the conversation. Should they stay in the suburbs or head downtown? Somebody’s spouse didn’t like the artsy movies at the Evanston theater. The third couple coming along was tired of Italian food. There were intricate negotiations about when and where, but never a discussion of including the kids. I didn’t feel left behind. In our house there was a clear boundary between adult time and kid time. Saturday nights meant one of my sisters was in charge or that I’d sleep at my Grandma Pauline’s condo. When I got older, I had sleepover plans with friends. As far as I was concerned, the system worked well. So I put the same system in motion when Bryan and I got married nearly 13 years ago and we moved to Minneapolis where we had no friends. Not one. My parents and their friends operated like an extended family, and I wanted the same atmosphere for Bryan and me. I remembered my parents attending 40th birthday parties for friends who are now turning 70. These friends hosted engagement parties and wedding showers for each other’s kids. They helped provide food and support during periods of mourning. What I miss most about Highland Park other than my family and my own childhood friends are my parents’ friends. I might not have tagged along on those Saturday nights, but we all had plenty of other time together as families. Bryan and I slowly (very slowly) made friends with other individuals in Minneapolis, which eventually turned into friendships with other couples. We’ve known some of our friends for over a decade. 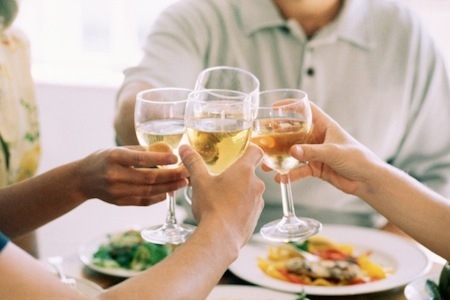 We make plans without the kids, with the kids, as foursomes, or in larger groups. We’re often making new friends, too, and we’re constantly introducing couples to each other. One aspect of these friendships that I knew I’d enjoy was the extended-family-like feeling that I already described. Until recently, however, I didn’t understand the indirect benefits of good relationships with other pairs. Bryan and I are a good example of Grief and Deal’s thesis. When we’re out with other couples, we’re on better behavior, which gives us a chance to see one another in the most flattering light. We’re each funnier, more interesting, and more interested. We look better, too. I do my hair. He shaves. We put in a little extra effort when we’re getting dressed. Going out with friends also brings out the team spirit in us. Before we leave the house, I remind Bryan not to criticize anyone’s parenting style. He reminds me not to overuse the expression, “I wrote about that on my blog.” I like these people, I occasionally have to tell him on the way to dinner, which is code he understands as “Do not discuss politics.” Other times I’m the one who needs to turn up the charm for a couple he likes more than I do. We kick each other under the table when one of us needs to shut up. The newest boon to our marriage as a result of our Saturday nights out is that I’ve started taking Bryan’s advice more seriously after noticing that several of my girlfriends seek out his opinion about various situations in their lives such as discipline issues with their kids, the benefits of a bigger family versus a smaller one, career changes, and even advice on how to deal with another friend. At first I was surprised when I saw the pattern. Bryan does not sugarcoat anything, but our friends already know this before they ask his opinion. He’s unapologetically “old school” in his approach to parenting and almost everything else. Ask your grandparents how they disciplined their kids, I’ve heard him tell one of our friends who at first mocked Bryan’s high expectations of our kids before she apparently revered them. Grandparents, he reminded her, not your parents. I admit that I’ve learned to tune him out when I’m not interested in hearing the harsh truth. But after watching my friends eagerly ask for his advice then listen attentively, I’ve learned to appreciate his insights into my life. Who knew I’d been living with a life coach all this time? Our friends knew! My best friend, Jenni, calls Bryan, “Brain.” She and I get a little chuckle out of it. Bryan feels good. Everyone wins. In other news, I am now officially my mother. Replace the velvet green appointment book with an iPhone and the vision is complete. Nina Badzin is a freelance writer living in Minneapolis with her husband and four children. She has written about parenting, marriage, friendship and more in The Huffington Post, The Jewish Daily Forward, Kveller, and elsewhere. You can read more of her work at www.ninabadzin.com and connect with her on Facebook and Twitter. Does Motherhood Have To Include Guilt?